NASA releases photo of weird rectangular iceberg | Watts Up With That? Photo credit: NASA/Jeremy Harbeck, click for larger image. The rectangular iceberg appeared to be freshly calved from Larsen C, which in July 2017 released the massive A68 iceberg, a chunk of ice about the size of the state of Delaware. Hey, they’ve spend years looking for the ice bridge, they’ve jsut found it ! Sorry, forgot to put the 61 after my name below, don’t want to confuse people. I haven’t cleared history or cookies lately so I don’t know why it didn’t auto fill? WordPress does not remember my details either. Nah … there aren’t any crop circles. Oh! but WAIT! … perhaps new fallen snow covered them up?! Aiiiiieeeeeeeeeeee !!!! That was my first thought. All this “Global Warming” has uncovered their secret lair, and this flight flew over before they could get it covered back up again! Nah, they just found some very average photoshopped guff. I’m wondering who and why. None of the images I’ve seen look like they’ve been photoshop, particularly the video. Always thought H2O had hexagonal crystals. Only approximately. The angle between two hydrogens is 104.45 degrees, not 120 degrees. Hexagonal crystals form in ice-I (the most common form of ice) because the H2O molecules are hydrogen-bonded together into roughly cyclohexane chair conformations, an oxygen atom occupying the position of each carbon atom in cyclohexane, C6H12: see https://en.wikipedia.org/wiki/Cyclohexane_conformation . Carbon atoms form 4 bonds each, at roughly tetrahedral angles (109.47 degrees). Since oxygen atoms form only 2 covalent bonds each, two of the 4 directions are to covalently bonded hydrogen atoms in an H2O molecule, and the other two directions are in longer “hydrogen bonds” to H atoms in other H2O molecules. Looked at along the C3 axis of symmetry, one sees hexagonal cross-sections, so the 120 degrees is not directly related to the H-O-H bond angle. In ice crystals, the 104.45 degree bond angle in a gas phase (isolated) molecule is opened up to around 106.6 degrees, not quite equal to the tetrahedral angle, so the hydrogen bonded atoms are not all on the same straight line as covalently bonded atoms (see http://www1.lsbu.ac.uk/water/hexagonal_ice.html ). This appears to be absolute proof that it’s not CAGW, Tom can get rid of the sarc tag. Two right angles do not make a rectangle. Perhaps someone turned up the power on those ice-measuring lasers. I’m climate sceptic, sceptical of everything and anything, just zoom in at the triangle bit just beyond the big ice rectangle; the tip of the triangle is identical to the bit just behind it. If you had bothered to read the description of that photo, it explicitly states it is a composite image to show what the entire berg looks like. Look a the other photos, they look genuine to me. Your claim they are fake does not hold up. Being gullible is a pre-requisite for Warmists. If you look hard enough at shadows and back ground there are discrepancies and if photos and video were taken with one flyby even two I call BS . really? what frame. what kind of discrepency? did you measure it? how? vukcevic , I see it. something is not right, two blended photos? In the close up there is open water right next to the berg. In the photo with the engine in it there is no open water close to the berg. And the open water that is a bit away is not the same shape as the open water in the closeup. Tom in Florida, there are two icebergs, that’s why the pictures are different. Got it. You can see the second one just above the engine. Which would explain why they mention only two right angles, rather than four. So, no aliens then to help us advance to a more complex stage of evolution. We’re on our own, sans monolith slab. Your buddies are not only amusing, but Johnny on the spot. Almost hovering. That’s kind of creepy, but maybe in a good way. There’s something off with the photo. I can’t find a copy of it at a website with “nasa” in the URL either. You’d think that this might be a “picture of the day” from NASA. There’s a NASA video also of the squareberg. How did they take that? Looks real to me. Jeremy Harbeck said he saw 2 rectangular icebergs. One, he said, had 2 corners that were extremely square. It appears the top photo is showing an iceberg with a very straight edge between 2 very square corners, but the far end is not visible. 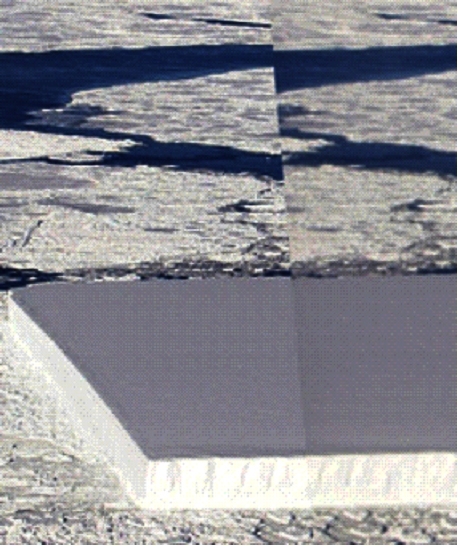 The 2nd photo shows an iceberg without such a straight edge and with more rounded corners. This may be the 2nd iceberg. If the berg partially visible in the upper left corner of the photo is the far end of the 1st berg, the photo discrepancies go away. The border and lighting look quite genuine. I doubt that it is a NASA fake – looks real to me. Its an untested belief of mine, that large blocks are broken off the ice sheet by the effect of tsunami. While the height of the wave may only be a foot or so, it could be enough to snap off a block along the wave front. The shape of the sea floor and an element of chance then decides how the lateral stresses square the block off. Playing devil’s advocate always raises good discussion, just in case we are not there yet eventually the truth will out. I think it’s a white flag and, hence, the French base Antarctic base. Antarctic Nazis have finally surrendered. Kudos for holding out longer than the last Japs. Two right angles do make a square or a rectangle. Did you not take geometry? A right angle has two legs not one. Now if they had said two corners then you would have a point. Now if they had said two corners then you would have a point. Very acute of you. Perhaps I’m being obtuse but the iceberg with straight(ish) edges looks like a trapezium to me, and the other, without straight edges, doesn’t have straight edges and is nothing special. Any idea of that little baby’s dimensions? It’s a black monolith covered in ice. And beating each other over the head with bones. This photo looks like its suffered from a bit of photo shopping to me. Took a look at the enlarged view of the nearside edge of this iceberg and the way this berg meets up with the other ice on the water surface just does not ring true to me. Maybe someone who used to seeing Arctic sea ice could tell me otherwise. ln the top photo there is a smaller ice berg in the bottom lefthand corner of the photo. Now that smaller ice berg fits in with the scene and looks true to life. Now if you compare that small berg ice to the large main one. Then the main ice berg just does not look right, its looking just far too neat and tidy to what would be expected in a real setting. The thing I wonder about is that we can see only 1/10 of it. I wonder what it looks like below the water. Could it be a rectangular prism? Why a surprise, our planet is not only flat but also rectangular, just look at any map. There is nothing that this global warming will not stop at. Now it is rectangularising icebergs!!! Clearly evidence of polar bears .. they are making landing sites to migrate from the arctic. If you look very closely you can see the Dutch tug that’s going to pull the slab to Arabia to supplement the fresh water supply. Or did I imagine that? A Chinese aircraft carrier in Antarctic camouflage? Thanks John, as they say you learn something every day. I beat Chad by only two minutes. It’s a stealth Japanese whaling boat. They should name it Habakkuk, to feed the conspiracy theories. Soon measuring ice area will be real easy. Green Peace got up there and sawed it off to add to Global Warming evidence. Someone call Leonard Nimoy on the Big Phone. Is the edge ratio 1:4:9? If I was going to cut one off for towing to Saudi Arabia the lead end would have an equal point. Looks to me like they will waste too much energy dragging it to a desert. I agree , it’s probably the Saudis that chopped it off and intend to throw if into a well in their back garden. Like the Larsen C ice shelf hasn’t been crumbling at the edge since the very first day it formed. It looks like Saskatchewan has frozen over (again). Wait long enough and weird things happen. There is no natural law that stops approximate rectangles from occurring so eventually they will. It’s actually very common just not many of us go there to see it … search “tabular icebergs”. National geographic had a photo from underwater of a triangular a while back. Let me see if I can find it. So if it was equilateral, it would be Ice Cube. Way cool in a cold climate. Extreme shapes! Clear evidence of man caused warming. Well if a rectangular calved iceberg isn’t conclusive proof of CAGW and the power of the Magic Molecule, I don’t know what is! Maybe not just an ice shelf the size of Delaware breaking off, but Delaware itself breaking off and drifting out into the Atlantic? Those Antarctic polar bears are quite creative indeed. Al Gores Fortress of Solitude and Casino. Perfect. All we need now is a biiiiig glass for the world’s biggest gin and tonic. Now where can we find a super-sized lemon? Japanese tourists used to pay top dollar for 40,000 year-old ice, with ancient air released in each bubble burst, in their adult evening beverages in Alaska. But that might have been in a simpler time. “5,800 square kilometers”?! Do these metric ignorants know what a square kilometer is? 5,800 square kilometers is the equivalent of a 76km square, or 50mile square. I thought that article was not bad for daily tabloid. Were you thinking that figure referred to the tabular iceberg ? If so you should read more carefully before throwing insults. And 1 mile x 1 mile is 5,800 square kilometers? My conversion table says there are 2.58998811 square Kilometres to 1 square mile, which sounds about right to me. As I’ve posted below the mile wide tabular berg is not the same as A-68 ice island which is ~5,800 sq km, but is believed to be a small fragment of it. Yes they do, here’s what they said, apparently you didn’t understand it. Here’s a video of A-68 breaking off you’ll notice some smaller rectangular fragments breaking off. So the chilleans are deploying an ice bridge. How many more rectangular blocks are they going to need? Hello esteemed “experts”, this is not an iceberg, it is an ice island. Google it! The difference between the two is relatively minor but becomes important when commenting on its shape. Most ice island have geometric shapes with straight edges. By definition, they are flat-topped. This one is cute but not unexpected. Not doubting the veracity of what you’re saying. I’m just commenting on what I can see on my screen. It’s the same as posing polar bears balancing on ice cubes. Gaia is building an icehenge. Ice should never be squared, as only pi are squared. Ice may be cubed, though.